Photograph of Lenton Church, used by kind permission of Ian Hamilton, photographer and copyright holder. 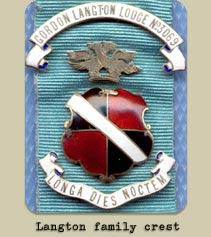 Until recently, the Spilsby Langtons are perhaps the most well-known, the family becoming prominent with Sir John Langton, High Sheriff of Lincolnshire, who was knighted in 1603 by King James I of England as the monarch travelled south from Scotland to London for his coronation. But, there are two other known Langton villages in Lincolnshire. Langton by Horncastle and Langton by Wragby. The first also gave rise to a Langton family, whereas it appears that the second did not. What’s more, there is another hidden Langton origin in Lincolnshire, about half way between Lincoln and Peterborough. This article focuses on these South Lincolnshire Langtons. The first Gilbertine monastery was in South Lincolnshire at Sempringham, and there are some ancient charters relating to this monastery, where Langtons grant land to the monks there. It was long supposed that these Langtons were the Langtons of Langton by Spilsby, however there are some problems with this assumption. The dates of the charters are early, in the period where place-name surnames were being adopted, and you have to wonder what the Langtons of Spilsby were doing owning land so far south. You might guess that they were disposing of a single piece of land that they acquired through a marriage settlement or some such, but if you look closer, you see that there were several Langtons in the area over a significant period and they own land in several places in the locality. Then you notice that the names of these South Lincolnshire Langtons are strikingly different to the names that occur at the same time in the Spilsby Langton tree. 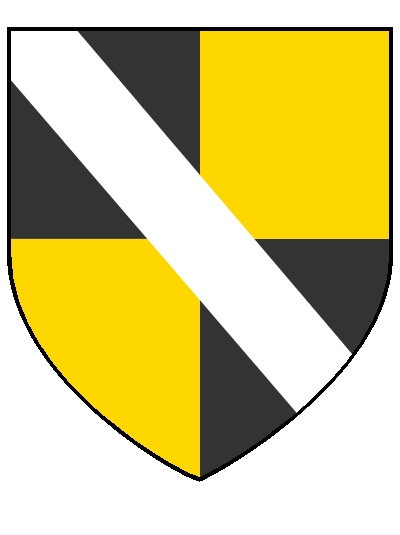 Or indeed the Langton by Horncastle family. What’s more, why give to the Sempringham monastery when there are other, closer monasteries that you could grant your land to and gain favour with the local powerhouse? More likely options would have been Bardney Abbey (who also a child priory at Skendleby and a cell at Partney), or Bullington, Stixwould, Kirkstead, Revesby, or Greenfield; all in the neighbourhood. We began to wonder if this was a completely unique Langton family. But, if that were true they would need a Langton village nearby. As it was in the period where surnames were taken, being called Langton meant that they came from a village called Langton. So where was this Langton village in the south? Looking at the map, we saw Lenton (also called Lavington) and Laughton in the vicinity of the lands mentioned in the charters and considered that the name of one of these two places might have drifted from Langton. Something that place-names are known to do. Lenton is now called both Lenton and Lavington; it is the same place, sometimes referred to as the village with two names. In Domesday book 1086, it is recorded as Lavintone but the v was probably pronounced as a u. About the same time, we were looking at what all the Langton villages had in common topographically and we discovered something quite intriguing. Langton villages suggest size i.e. Long village or ton (town). The reality is however the opposite, that they're all small. The reason for this lies with a coincidence of language. A hill or ridge in Saxon times was a –don, a settlement was a –ton which later gives rise to the word town. So a ridge would be a Langdon and as soon as buildings start appearing at the bottom of the ridge they would naturally be called Langdon. But that hardly makes sense , buildings called in effect, long-ridge. Langton on the other hand makes much better sense, and so whether by design or not, these settlements almost immediately became Langton. That seems to be why all Langton villages are associated with ridges. Lenton/Lavington has the same features, and Laughton sort of does (it occurs at the end of the ridge). It looked like one of these villages were once called Langton. But that wasn’t enough evidence. So we looked very hard on the internet and eventually found the proof, a reference to Lenton once being called West Langton. The West part is handy because it shows that it needed to be distinguished from another local Langton village. There had to be another place called Langton probably East Langton. At First we thought that Laughton the other side of the ridge was East langton (Laughton) but that is not the case. The 'East' langton settlement is almost certainly the lost medieval village of Little Lenton/Lavington half a mile north east of Lenton situated near where the old road (now a footpath) dissects the old Roman road. The place is now called The Grange. The road continues east to Folkingham which was the home of the first Gilbert of Ghent (Gant) a major landowner in Lincolnshire. So the research shows that the Langtons of South Lincolnshire were almost certainly not from Langton by Spilsby, or Langton by Horncastle, but from West and East Langton (Lenton/Lavinton) in the south. Now let us take a look at the Lincolnshire shields used by the Spilsby Langtons, and also by the Horncastle Langtons. As you can see they are quarterly with a bend. 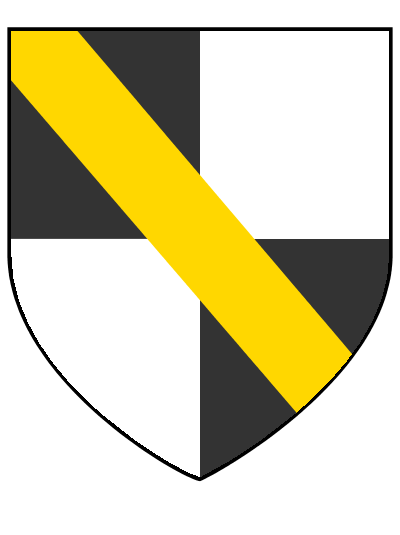 This shield is in fact based upon the Earls of Lincoln who were among the first to use this design. 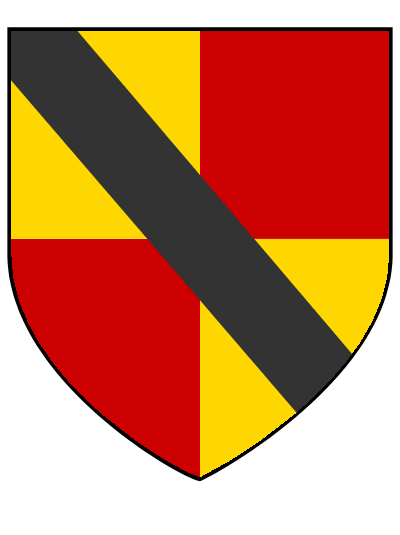 There are several Langton families outside of Lincolnshire who also use a variation of this shield, including the Langtons of Maidenhead in Berkshire, the Langtons of Teeton in Northamptonshire and some Langtons in London. Clearly the same design. 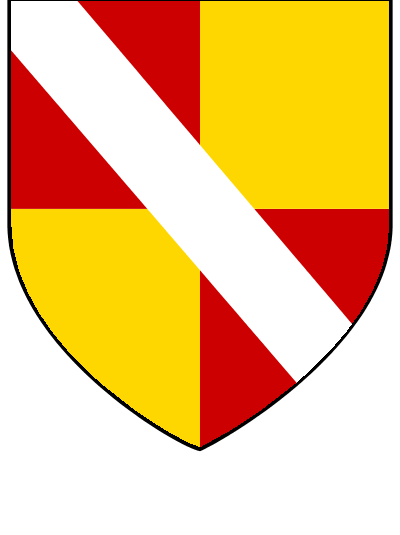 There is also a variation of this shield used by Bishop John Langton of St Davids who may also come from one of the Lincolnshire families. For a more in depth look at Langton shields, check out the Exhaustive shields article. There are several descendants of these families who have spread far and wide and can trace back to one of these Langton families. Our hope was that in time, living Langtons descending from these families would take DNA tests and confirm that there were at least three different Langton families from Lincolnshire, namely, 1. Langton by Spilsby, 2. Langton by Horncastle, and 3. Langton (Lenton/Lavington). There was a small possibility that Langton by Wragby also gave rise to a family bearing the name as well, but it was a small village at the time of Domesday, and there are no early deeds showing Langtons in the close vicinity. Through other research we managed to join the Langtons of London with the Langtons of Maidenhead, and at the top of the London tree an uncle of the Langton living in London came to visit and unfortunately died while staying with his nephew in London. I say unfortunate, but actually for us, it was very handy, as he is recorded as visiting from Bennington in South Lincolnshire where he lived. So, we seemed to have a line from a Langton in the south of Lincolnshire near Lenton/Lavington through London, to Maidenhead. Recently two different Langtons who descend from the Maidenhead Langtons, David Langton from Canada and Andrew Langton from England, have taken DNA tests. They share a common ancestor about 300 years ago, and not only do their DNA profiles match each other very closely, but they do not match either of the profiles we already have from Langton by Spilsby, or Langton by Horncastle. This is the evidence we needed to prove the theory; the Langtons of South Lincolnshire famous for their association with the Gilbertine abbey of Sempringham, originally lived in and took their surname from Lenton/Lavington when it was known as West Langton, circa 1150AD, and the Langtons of Maidenhead and its offshoots are their descendants. Hopefully, once day we will have DNA from descendants of the Langtons of Teeton in Northamptonshire, and we can understand which of the three Langton families of Lincolnshire they themselves descend from.